Last night, we witnessed the birth of three new relationships plus the continuation of two previous train wrecks already in progress. 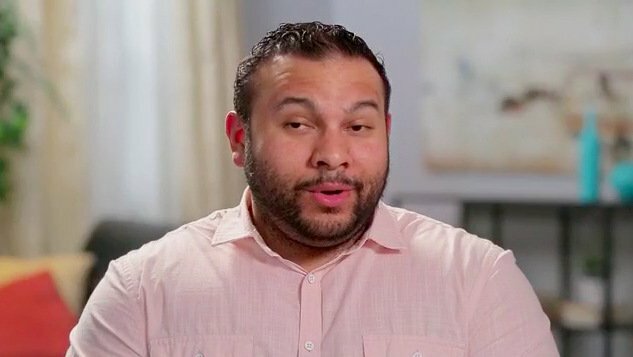 Ah, our beloved 90 Day Fiancé Before The 90 Days is back! And holy Bahtman, is it back with a bang. 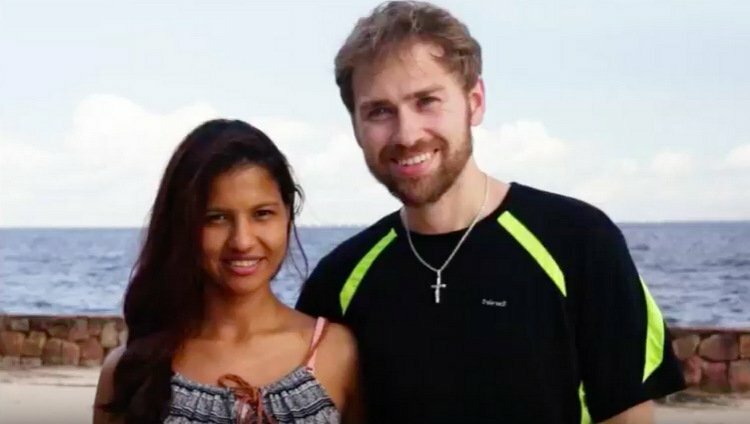 It’s still the same mix of May-December couples we’ve grown used to cringing at on many seasons of 90 Day Fiancé past, coupled with a few new twists. Some old faces, and a few new. The Danielles and Nicoles of yesteryear have been replaced (and dare we say, potentially out-crazied?) by the Angelas and Rickys of today. And the potential for frauding, stalking, and white binders is at an all-time high. I forced my husband to watch last night’s premiere and, like most semi-sane humans, he repeatedly asked aloud, “What is WRONG with these people?! ?” I didn’t have the heart to tell him that what’s wrong with them is precisely what makes this show so right. But we all know the secret sauce of delusion is necessary for some good old fashioned 90 Day drama, and this season looks to be dripping in it. Let’s take a look at the couples introduced last night. We didn’t meet everyone (two additional couples will also be featured this season), but we did get a whole lotta messiness from the ones who showed up. 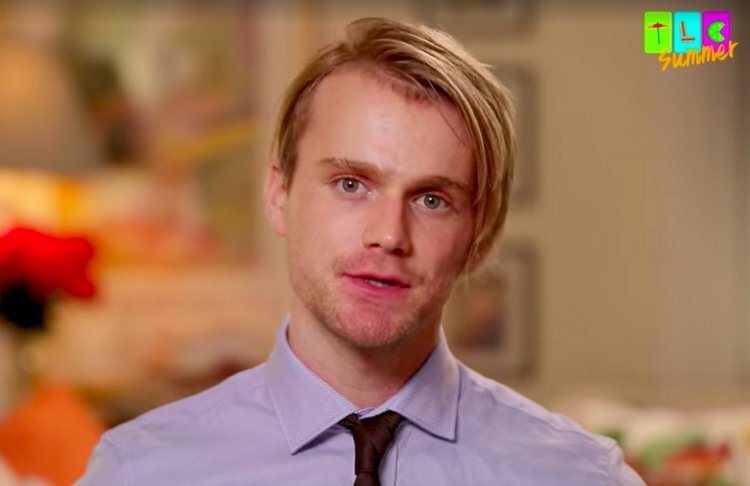 Remember the 24-year old serial killer from Amsterdam that 42-year old Darcey fell in love with, got scolded by at the reunion, and has been fighting with on social media ever since? Well, good news! He’s coming to America. Darcey admits that since the Tell All last year, at which Jesse went FULL METAL PSYCHO on her, she’s needed time to reflect. This reflection has revealed that Jesse is still the one for her. Even Darcey’s cousin, who she shops with before Jesse’s arrival, warns her that Jesse is waaaaaaay too controlling. For example, he demanded that Darcey freeze her social media activity when she posted something he didn’t like, and she immediately acquiesced. Thus, no one has learned jack squat since last year. But all is forgotten when Darcey sees Jesse lumber out of the airport gate. He’s tall, he’s looking like an Instagram model had a baby with Erik the Vampire (#TruBlood4Life), and he’s ready to take a bite out of the Big Apple. But Darcey would rather Jesse take a bite out of her! Instead, Jesse keeps prodding Darcey to give him a “tour” of NYC in the car on the way home – something she is ill-equipped to do. So she pouts. Her insecurities are instantly lit aflame, and it’s only going to be downhill from here. It’s also been a few months since Paul came home to Kentucky, leaving poor Karine back in Brazil to fend off muggers with machetes, solo. (As if she’s not already used to that…) During this time, Paul has been raising money to return to the Amazon, although proof of an actual job is never offered. Paul’s mom is happy to have her boy back to herself and has likely been gathering swaths of hair to wad up for his next adventure overseas. She is also pleased Paul hasn’t burned her home down yet. Before he sets sail again with SIX MILITARY CRATES OF STUFFED ANIMALS, Paul meets up with an ex-girlfriend to discuss his plans to marry Karine – and to admit his fears about what Karine may be doing behind his back. Um, WHAT? Paul’s ex, who is a brave soul to even admit on national TV that she willingly dated this dude (with no promise of a green card), sits in awkward silence as Paul drones on about Karine needing to take another STD/pregnancy test upon his return. 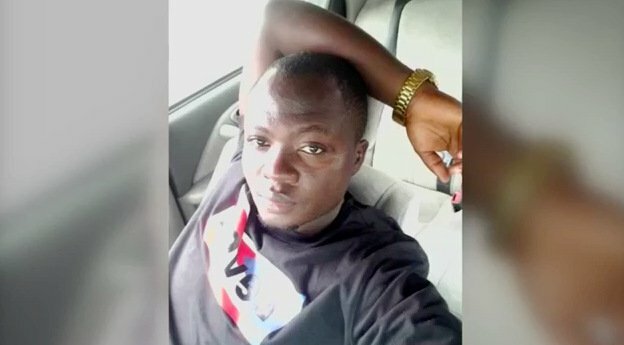 He needs to be sure that his women are clean, yo! And that they don’t mind him 1) having a felony on his criminal record, 2) wearing an entire Hefty bag as a bathing suit, and 3) asking for your hand in marriage by making the universal finger-in-hole sign for “f**king” to your parents. MY GOD. If this scene has done anything, it’s provided Paul’s ex with proof positive that she’s made at least one good breakup decision in her life. Alright, first things first: Angela is admittedly no stranger to reality TV, having appeared on multiple episodes of daytime talkshows and specials in the past. But I’m gonna go ahead and welcome her into this cast with open arms because she brings the crazy to a whole new level. And isn’t that what we really need? But first, a stop at the pawn shop. Angela needs to buy Michael a ring, which she purchases on layaway because she’s already invested every red cent into her plane tickets. Angela’s daughter tears up as she watches her pathetic mess of a mom scratch together funds to buy Michael a ring, knowing inevitable disaster awaits. 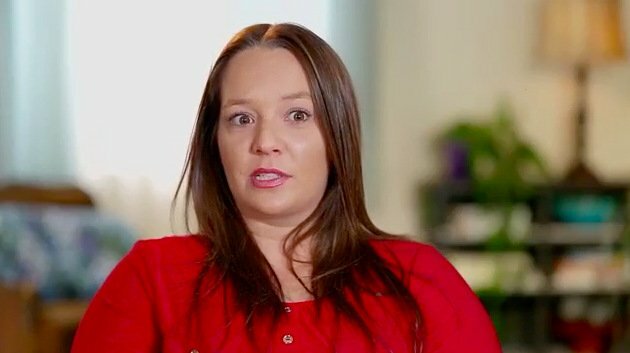 Even Angela’s hairdresser can’t hold back when producers question her about the situation. She deadpans that Angela is “a mess, but she’s a wonderful person.” At at least she tries to make Angela look purdy for her trip and nods her head as Angela drones on and on about what a perfect match Michael is. Angela will be leaving her sick mother behind, who she cares for full time. As she tells her friends and daughter in the smoking tent of the local bar (I sh*t you not – I cannot make this stuff up), it’s time for her to stop taking care of everyone else and start taking care of herself! And by that, she means traveling 5,000 miles away to get conned instead of just buying a scratch-off ticket at the local 7-Eleven like everyone else. Oh – we also learn that Michael doesn’t have any photos of Angela on his phone because “it’s not allowed in Nigeria.” Angela believes this excuse 100% and will fight you if you question it. 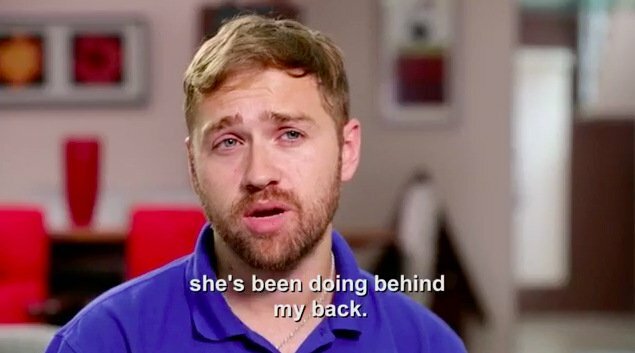 Angela’s hairdresser sums this trash heap of a situation up best when she says, “I believe she’s being brave and stupid.” Yup…the deadliest combination. Speaking of that deadly combination, let’s meet Ricky. Oh, Ricky, Ricky, Ricky! What are we gonna do with you, boo? A 33-year old Ohio photographer and father of two, Ricky has had bad luck with marriage. He’s in the midst of divorce number two, so he thought it was the perfect time to search for fake troll accounts love online. Ricky plans on traveling to Colombia to meet Melissa, who he’s texted with every day via a translator app, ala’ Paul and Karine. One time, he tried to video chat with her but tells us it looked like a video on a loop because she wouldn’t reply to any of his questions. “This could be the love of my life!” cheers Ricky, even when his daughter, all of his friends, and his own brain basically tell him he’s being a HUGE FOOL. Now, she plans on leaving Ella with her father, packing up the baby, and heading to England to meet Jon in person. A few notable things that have happened since Rachel’s baby was born: She’s begun referring to Jon as her newborn’s “daddy,” she sent him a piece of her baby’s UMBILICAL CORD <dry heave>, and she’s discovered that Jon has a criminal record. Not necessarily in that order. Rachel’s father and friends, who she talks to before leaving, are majorly concerned about Jon’s intentions. His record includes violent incidents, which doesn’t spell safety for a single mom and baby traveling alone to meet a stranger. Rachel clearly has some self-esteem issues to overcome, confessing that she’s insecure about her postpartum body and that she can’t believe someone as “hot” as Jon is into her. “I’m constantly questioning why Jon is willing to take me and a baby on,” reflects Rachel. UM, YEAH. Ya think?? Omg, you guys – I don’t know if my heart can take this one. She’s bringing a BABY with her? No, nope, nah. This is not going to be good. TELL US: THOUGHTS ON THE NEW COUPLES? WHO IS IN FOR THE BIGGEST SHOCK?